A couple of years ago before I started quilting, I took a picture of this quilt in a store somewhere. 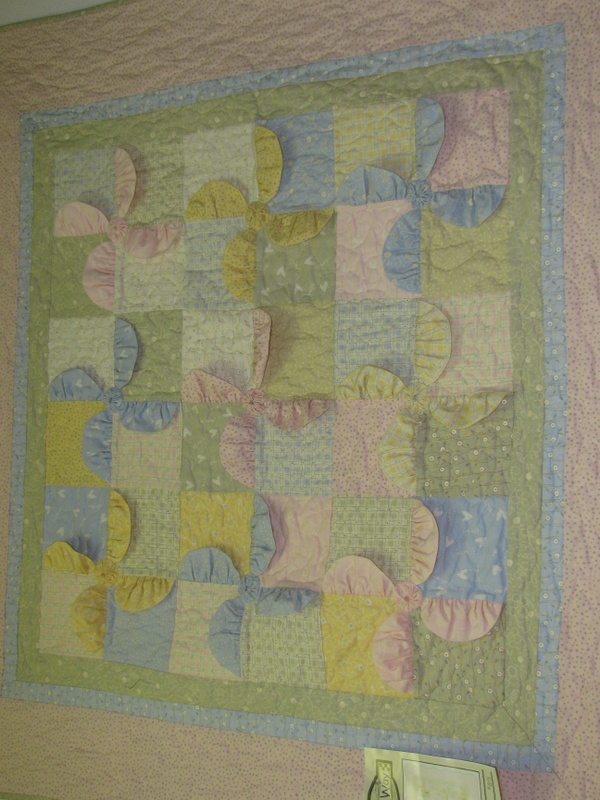 I need to make a baby quilt and would like to try this one if I could ever find it. Thanks for any help and I hope the picture posts. I don't know pattern name but it would be easy to make. Decide the size squares you want to use then cut circles withblittle smaller diameter. Put circles right sides together and sew around edges, cut in half then turn right side out. Place one half between squares before you piece them. Them make yo-yos for centers. Hope this helps. I Agree with ontheriver except I think you'd want the circles a bit bigger than the squares. First, you need to allow for the seam allowace and second, it appears that the edge of the half circle has been gathered a bit before it was sewn into the seam. I would guess that they are about an inch larger. Also looks like the circle is held about 1/8" from the edges of the square. Right, I see I didn't consider the gathering. The designer's site is down for maintenance, but she sells the pattern, too, if you can wait, and she'd get full price if you bought it directly from her. Looks pretty simple to make. Just cut some circles, then sew and turn inside out. Gather and stitch to one side of the square block. Make some yo-yo's and you're done! I'll have to save this pic. Really cute and simple for a little girl baby-----------------or boy in other colors. Learn something every day-------------your method of making the semi-circles would be a lot faster than what I envisioned. I love that quilt! Think I might make it for just in case. Dead easy to work this one out.Why not give it a try? Not to get up anyone's gander, but this is what copyright protection is about. The designer should be protected. Mom2boz wanted the name so she could purchase it, I believe. The picture came from a store. Ghostrider gave her the info. We shouldn't be sharing how to steal someone elses designs. Just my opinion. Thanks for saying that, mcdaniel23. I totally agree with you. This is a unique, original idea and the designer has every right to benefit from her work on it. Eight dollars is certainly not an exorbitant amount of money for a pattern like this. or Google will happily give you her email addy or phone number if asked nicely. Last edited by ghostrider; 09-08-2012 at 03:42 AM. Such a cute patter. I went online and bought it already. I have a new grand baby due in March! Thanks for the links! Her blog is really neat! I'd love to know how to do that crocheted edge on the baby blankets. She says a double crochet stitch, maybe I can figure it out. She uses Bliss flannel for them. Apparently just two layers of the flannel and then does the edge. She has a lot of really neat (guess that dates me, LOL) stuff! P.S. I like the pastel version of the Pinwheel Posies Again in the pic at the beginning of the thread better than the scrappy one tho. Sweet quilt. Don't forget to post a pic of your finished quilt, too. I saw this in a Quilt Sampler magazine a while ago. I bought the pattern: It is called Pinwheel Posies Again by Cotton Way. I believe I went to Cotton Way's website and bought it from them. Thanks everyone for your input. I had considered trying to make my own pattern but the more I looked at the picture, the more I thought the pinwheels did not look like full 1/2 circles. I will track down the pattern - thanks for the links. There are some other really neat contemporary patterns there worth looking at too. Last edited by ghostrider; 09-24-2012 at 01:19 PM.